STARK 4 1/2 LATHE DRIVE TRAIN: This is the best feature of the lathe. The enclosed variable speed drive train is fantastic. There is no setup required. Chips cannot get in the works. It has continuously variable speeds from 280 to 3500RPM. It has a multi-disc clutch and brake built-in. There is no need to set up a separate jack shaft. It is driven with a matched pair of V-belts, which in turn are driven by a wide V-belt with a variable width pulley at either end. I checked the belts; they are in excellent condition. The tall vertical lever on the front side of the lathe is the clutch and brake. The handwheel beside the clutch lever is the variable speed control. There is a forward/reverse switch with a built-in speed indicator and a safety reset. The motor is a venerable General Electric Polyphase 220/440V 3 phase ball bearing motor. The below listed phase converter was set up for use with this lathe and is available with the lathe for a discounted price. I have tried it on 3 phase and single phase; it works well on both and I will be glad to demonstrate for you. Photos above and below illustrate the drive train. THE HEADSOCK SPINDLE IS ANOTHER GREAT FEATURE OF THE LATHE: The Stark 4 1/2 has a double set of precision ball bearings just behind the spindle nose and a 3rd set at the back end of the spindle. The lathe works with 5c collets even though the lathe calls for 42s collets. I will be glad to demonstrate how well it works with 5c collets. 42s and 5c collets have the same 1" + capacity, the same straight shank OD of 1.25" and the same threads. The taper is different. In the closeup of the spindle nose with a 1" 5c collet in it, note the fine finish that was achieved facing off in this lathe. Also note the gap around the perimeter of the collet; the 5c collet taper contacts the spindle around the perimeter at only one point, which is enough to do the job--if not ideal. It is possible to add a 5c to 42s spindle taper adapter, but I have an ever better plan. The lathe has a 2X10TPI spindle nose. When I find the time I will make a Hardinge taper spindle nose adapter to fit this lathe so that I may use my Hardinge chucks and 5c collets on the Stark. If you have a good 5c taper spindle nose I could adapt to this lathe, let me know. An alternative plan would be to make a spindle nose from scratch, machining the exterior directly on the Stark spindle nose, in which case I would need the expertise of someone knowledgeable about hardening steel. 5C TAPER NOSE SPINDLE. Cut off the nose, machine it to fit on the Stark lathe and you may use Hardinge taper spindle nose chucks, etc. on the Stark. The Hardinge nose is case hardened (only the exterior is hardened), so it may be machined without difficulty. I bought this for use on the Stark lathe, but I have another use for it as well. If purchased with the Stark lathe the price is $600. If purchased separately, the price is $900. THE STARK 4 1/2 LATHE WILL ACCEPT A THREAD CHASING ATTACHMENT: There are attachment points on the back side of the lathe to accept a thread chasing attachment. This is a great feature. I love my Hardinge thread chasing attachment. If you have a Stark thread chasing attachement available, I may want to buy it. THE STARK COMPOUND: Also note the T-slot on the cross feed side of the Stark lathe compound in the above photo. This may be used to install feed limit stops. The bevel stop that butts up against the side of the lathe bed may be quickly adjusted with a hand adjustable lever; this allows you to perfectly position the compound to get the maximum feed as needed. In the left photo below you see a Hardinge D9 toolholder mounted on the Stark compound. The Hardinge D-9 toolholder is included with the Stark lathe. 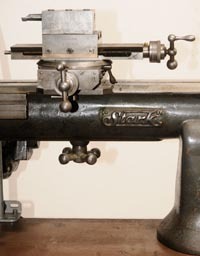 The Stark and Hardinge compounds and lathe beds are similar so you can use a compound from one lathe on the other lathe, although T-slots, T-bolts, and compound heights differ. A used compound feed screw came with the Stark lathe, so probably at least one compound feed screw was replaced. Both compound feed screws are in good condition with little play. MANY HARDINGE and ELGIN COMPOUNDS FIT THE STARK LATHE Illustrated is a Hardinge DASR compound and an Elgin compound on this Stark lathe. These 2 compounds are not for sale, but 2 more Hardinge compounds that fit this Stark lathe are available and listed on my HARDINGE & ELGIN BENCH LATHES and accessories web page. Be sure that you get a Hardinge or Elgin split bed compound for the same size swing of your lathe. The Stark T-bolt does not fit the Hardinge or Elgin compounds, but the Hardinge or Elgin T-bolts do fit the Stark lathes. Alternatively, another T-bolt may be easily made. The Hardinge or Elgin compound yolks also fit the Stark lathes. 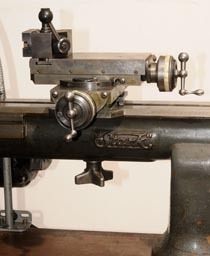 OTHER GREAT FEATURES OF THE LATHE: There is a T-slot on the front side of the bed, which is visible in the left photo above. I do not know what this is designed to be used for. I surely would like to have some literature on this lathe. I am also willing to buy Stark lathe accessories. Let me know what you have. 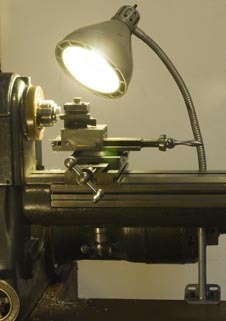 Also in the left photo above is a light that is ideal for use on the Stark lathe. That light is listed below. ADJUSTABLE MACHINE LIGHT. This light is good for use on a lathe. The neck is about 24" long. It remains cool to the touch with the double insulated reflector. It will clamp onto a table top edge up to 2.25" thick. It is illustrated on the above listed Stark 9" swing lathe. $75. STARK 4 1/2 LATHE. Stark lathes are uncommon; the model 4 1/2 is the rarest and most desirable. 9" swing. 20" + between centers. Great Drive train. Set up to accept a thread chasing attachment. Split bed lathe similar to Hardinge Cataract lathes. You may read about the lathe at: lathes.co.uk. $OLD. 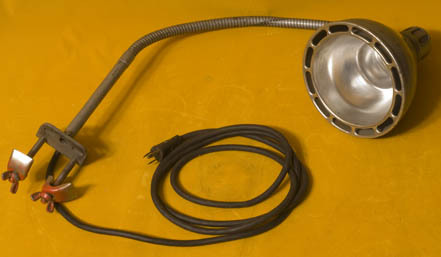 The work light, the power converter and the Hardinge spindle nose are still available. I will leave the information about the Stark lathe up for awhile for your information.